What are your legal rights if ICE agents show up at your door? NEW YORK -- The American Civil Liberties Union is offering guidance for people who may be concerned that U.S. Immigration and Customs Enforcement agents may come to their home. The organization has posted specific instructions on its website and is publicizing it, amid concerns over President Donald Trump's immigration policies targeting illegal immigrants. New York City officials have also warned about fake ICE agents, saying these scammers are telling people to hand over cash or they'll be immediately deported (more tips from ICE below). 1. Ask the agents what they are there for. 2. Opening the door does not give the agents permission to come inside, but it is safer to speak to ICE through the door. 3. If the agents don't speak your language, ask for an interpreter. 4. If the agents want to enter, ask them if they have a warrant signed by a judge. If ICE agents do not have a warrant signed by a Judge, you may refuse to open the door or let them in. An administrative warrant of removal from immigration authorities is not enough. 5. If they say they have a warrant, ask them to slip the warrant under the door. 6. Look at the top and at the signature line to see if it was issued by a court and signed by a judge. Only a court/judge warrant is enough for entry into your premises. One issued by DHS or ICE and signed by a DHS or ICE employee is not. 7. 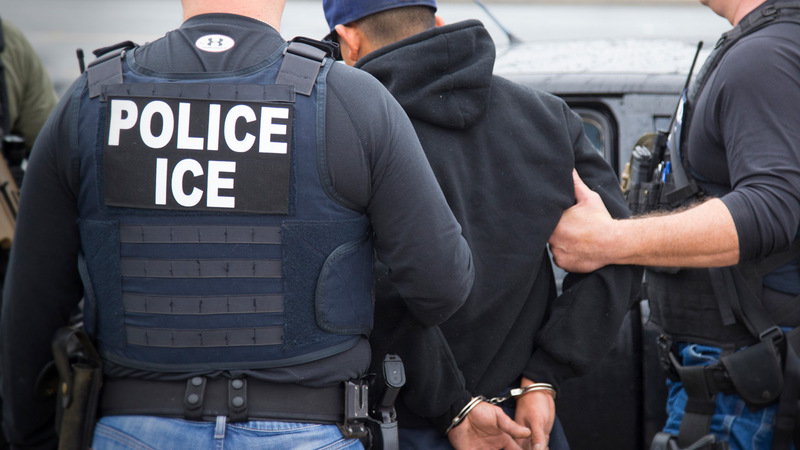 Do not open your door unless ICE shows you a judicial search or arrest warrant naming a person in your residence and/or areas to be searched at your address. 8. In all other cases, keep the door closed. State: "I do not consent to your entry." 9. If agents force their way in anyway, do not attempt to resist. If you wish to exercise your rights, state: "I do not consent to your entry or to your search of these premises. I am exercising my right to remain silent. I wish to speak with a lawyer as soon as possible." 1. If members of the community are approached by someone purporting to be a federal immigration officer, they should respectfully request to see the person's badge and credentials. 2. If the individual is unable to present a badge and credentials it should raise a red flag. People should also be suspicious if the "officer" demands money or if he/she detains someone and refuses to disclose where they are being taken. 3. If members of the community suspect they've been contacted by an "impostor" immigration officer, they should report the encounter immediately to local law enforcement and/or call ICE's 24-hour toll free tip line at 1-866-DHS-2-ICE. Check out more information from U.S. Immigration and Customs Enforcement on the agency's website.